Some couples make the wedding day about themselves but this overlooks the joy and happiness that your guests have for you on the big day. 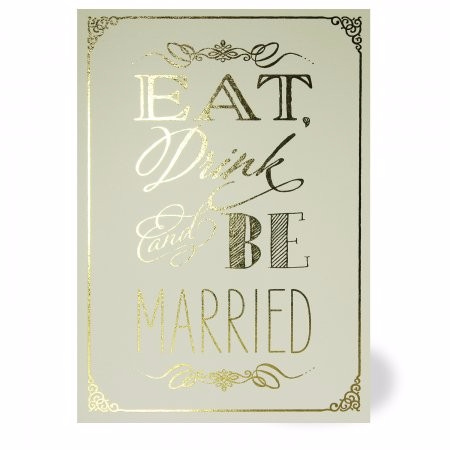 Your wedding should be a celebration that everyone can join in with and this is the tone of the Eat Drink and Be Married wedding invitation by Chapter One. Following on from the success of the “Keep Calm and…” design products, barking out a clear instruction is a highly effective way of getting your message across and with this card, you are telling all of your guests to have a good time. It is a simple looking card, coming on ivory board with the text in a gold foil, but the simplicity of the card is a key factor in why it will work for many people. This is a card that as soon as you see it, you know what is taking place and the reverse of the card provides plenty of space to personalise the information you need to provide. You’ll also find a range of additional products with the same style so if you are looking to undertake a lot of correspondence around your wedding or you want to create a unified theme on the big day, you’ll find that there is an opportunity to be cohesive in everything you do. It’s a wedding invitation that gets straight to the point so if you are a couple that doesn’t want to mess about, this is the invitation for you. When there is a party to be enjoyed and celebratory times on offer, why waste time?